Last weekend we celebrated Mother’s Day with my mommy in Santa Cruz. On Saturday, Joshua, Dani, and I took her to a quaint little tea room called The Quail & Thistle Tea Room. 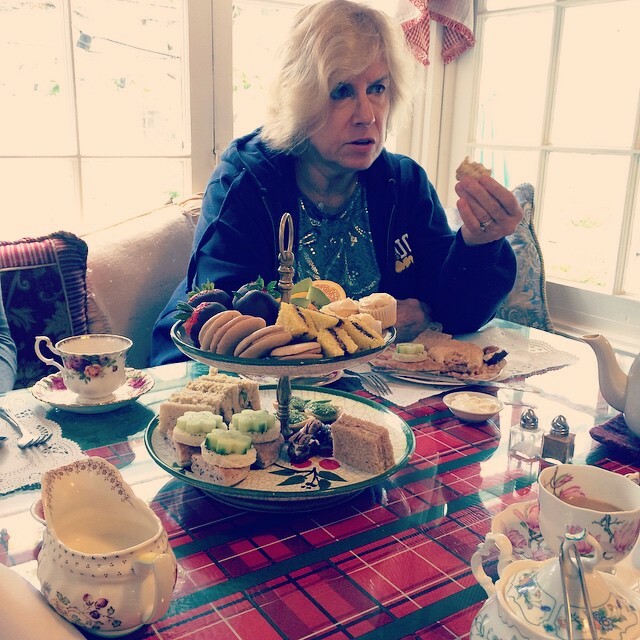 We had their California Country Tea, which consisted of salad, scones tea sandwiches, baked goods and of course, tea. It was so cute and super yummy! The word of the last couple of weeks has been hustle. I got my designed approved for the 2015 CGA Strategic Conference. Since we’re spread a little thin these days trying to get project out the door, I’ve been busy building out the design. I literally finished the build last night, and hopefully it will be going live in the next day or so. I’m really proud of how my build turned out. I was nervous about it since I haven’t built anything for DG in a couple of years (since I first started as an intern), but with help from my developers I was able to build something I’m really proud of. When I haven’t been working, I’ve tried to sneak in working on a mood board for The Lovely Geek. I’ve also been getting familar with a new design program called Sketch, which I absolutely love! It takes the best things about Photoshop and Illustrator and puts them into one in a program that is actually made for designing websites. After reading this case study on Smashing Magazine I finally gave in to using it on of my projects. Once I did, I loved it! Not to mention my developers at work are a lot happier I did too – it makes life a lot easier for building.